There are a number of different nail options when it comes to home building, carpentry, boat building and marine repairs. Understanding the different types, as well as the variety of metals and what each is best for will help to make the proper choice easier. Siding Nails are available in top-of-the-line 316 stainless steel. Siding nails have smaller sinkheads. Their ringed shank provides extra holding power, and their blunt tips help minimize splitting. Annular threaded, stainless steel siding nails have been found to work best overall, and are perfect for pressure-treated, cedar, and redwood. Ring Nails- The shaft of a ring nail has a threaded portion comprised of multiple ring-like threads rolling completely around the shank. This feature is what gives the nail its reputation for being highly resistant to withdrawing. Available in galvanized, 304 stainless steel, and silicon bronze. Slating Nails Most people call them Roofing nails. Mainly used on tile and slate roofs, or in situations where a large nail head is needed. Available in traditional copper or stainless steel, both types of slating nails feature a large flat head, annular ring, and diamond point. Common Nails We carry smooth shank common nails in 304 stainless steel alloy, copper, and galvanized. These nails are a mainstay of wooden boat construction, and woodworking projects in general. We do not carry aluminum common nails as they mostly lack the corrosion resistance necessary for use in a demanding (marine) environment. Our complete line of nails and fasteners is available on the internet or through our catalog. 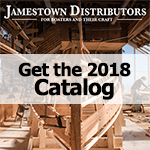 Jamestown Distributors carries every fastener in the book: nuts, bolts, machine screws, washers, wood screws, etc.